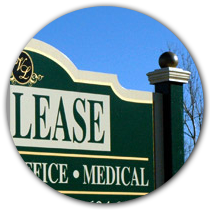 Post & Panel / Real Estate | Laminators Inc.
Post and panel signs are perhaps the most cost effective and widely used signs in the commercial market. They are simple, durable, come in a wide variety of shapes and sizes and can be easily installed. Post & Panel signs are ideal for site identification, wayfinding, and directional & informational signage applications. Our sign products can be mounted to either wood or aluminum posts making them suitable for any interior or exterior Post & Panel system.